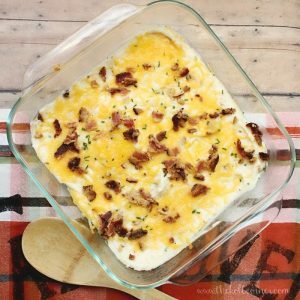 This loaded mashed potato casserole is so packed full of buttery, cheesy, bacon-y goodness, it takes the classic dish to a whole new level. Preheat oven to 350 degrees, and bring 4 quarts water to a boil. Boil cubed potatoes until soft, drain off water when finished. White potatoes are boiling, cook bacon in oven at 350 degrees until crispy. Remove from oven and absorb extra grease with a paper towel. Crumble and set aside. In a large bowl, add cooked potatoes, cream cheese, butter, and seasonings. Beat together until creamy. Stir in 1 tbsp chives, 1 cup cheese and half of bacon crumbles. In a 9x13 baking dish, spoon in mashed potatoes and spread out until top is even. Top with remaining cheese, chives and bacon crumbles. Bake at 350 for 15 minutes, or until cheese is melted and bubbling.